We are pleased to announce we have just launched the English version of our website Exquisuits and advanced platform to order high-end bespoke suits online. It has been valued as the most exclusive platform in the international market (Google has positioned it on the first page for the search in Spanish “trajes online”). 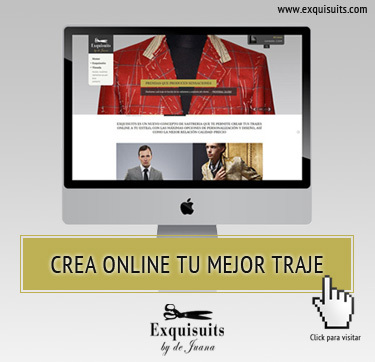 Created by Javier de Juana, President of the exclusive Tailors of Spain Club, and Hugo de Juana, online platforms specialist, Exquisuits offers you a new commercial experience combining the best of the high-end traditional retail and of the Internet. 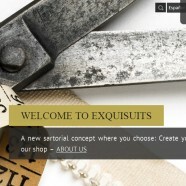 Exquisuits offers visitors a suit online configurator that enables them to customize their suits with the maximum personalization options regarding details and style, buttonholes, initials, lining colors and lapels, etc. Besides, the site counts on a new measuring system that makes possible to know the configuration of the customer through internet with precision and eliminating the traditional measuring. On the other hand, you can choose to visit our shop, receive advice on personal image and select your garment among more than 5000 samples of the most selected fabrics. Since a different level of service is provided in each channel, online orders will benefit of a 25% discount in relation to those ordered at the shop. Exquisuits makes all their garments entirely in Europe. Each garment is made combining high technology with hand-made work carried out by highly qualified tailors. You can know more about the proverbial quality of our suits here. 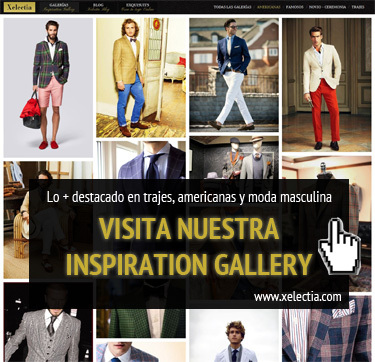 This new online concept opens new expectations to the evolution of the Spanish Bespoke Tailoring.